Go Fish! | Home Cookin' | Kids VT - small people, big ideas! As warm weather returns, I like to cook a little lighter, and fish cooked well fits that bill. I remember my mother's preparations of fish or other cutlets for frying — one bowl for dredging the cutlet in flour, one bowl for dipping each piece in an egg wash and a final bowl for coating it in bread crumbs. Each cutlet would be quickly browned in butter and then baked until cooked through. The result was a crispy, delicious treat, perfect for cold weather, but not something I'd prepare in summer. I used the same technique for years until I found several methods that are less messy, and less fatty. The one described below is my favorite. The result is more delicate than with the three-dip method above, perfect for a healthy summer meal. 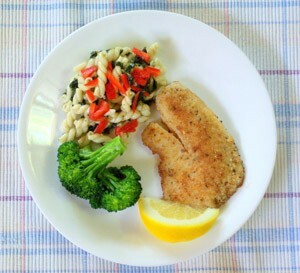 Mild-flavored tilapia is ideal for kids who typically don't like fish. Add a bright green vegetable and a potato or pasta salad, and this could become one of your favorite family meals. Place the fish on a clean surface and pat dry with a paper towel. Place the bread crumbs, salt and pepper in a small, wide bowl and toss to combine. Brush each piece of fish with a light coating of mayonnaise and place in the bread crumbs, turning to cover both sides, and pressing lightly to get the crumbs to adhere. Heat a 10-12-inch skillet over medium to high heat and add 1 tablespoon of vegetable or olive oil, tilting the pan to coat. Place the fish in the pan, cooking until browned, about 2 minutes, and carefully turn each piece over. If the pan looks too dry, add another tablespoon of oil. Continue cooking until the fish is cooked through, about 2 or 3 more minutes on the second side. Serve with lemon wedges or ranch dressing. This recipe works just as well with pork, chicken or turkey cutlets. Kristina Creighton is a former restaurant owner and the author of Kristina's Kitchen Cookbook and The Practical Palate Cookbook. She lives in Granville.